Boldon School hope that all students will be successful in their examinations. To ensure that examinations run as smoothly as possible, there are a number of rules and regulations that you must be aware of. Students will be taking public examinations at various times during years 10 & 11, either controlled assessments or full GCSE’s and/or BTEC’s. This can be a stressful time for students and parents and it is imperative that all those involved are as well informed as possible. 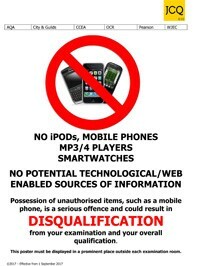 Well-informed students will realise that the rules and regulations are in place to ensure fairness and to minimise disturbance and it is in the interest of all that the examinations run smoothly. Boldon School will make every effort to ensure that candidates receive the best possible preparation for their examinations, that the administrative arrangements run smoothly, and that the examinations are conducted in a way that will cause as little stress as possible and help students to achieve their best. Students are expected to attend school as normal while examinations are taking place however students may be allowed to leave school at the end of any afternoon examination so may arrive home either early or late depending on the length of the examination. If your child has been entered for an examination and is absent for reasons other than sickness you may be charged the entry fee. The information on this page is intended to inform about examination processes and procedures and to answer some of the most frequently asked questions to help to guide and support students and parents through the examination process. If you require any further information or have any queries please contact our Examinations Officer, Miss Nicky Korn on 0191 535 2176. As well as the documents above there will be informational posters displayed in and around the examination venue when you arrive for your examinations (please see examples below). 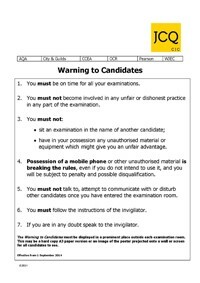 It is essential that the instructions on these posters are followed to ensure that your examination entry is not invalidated. You MUST attend all examinations that are scheduled on your individual examination timetable. Misreading the timetable will not be accepted as a satisfactory reason for absence. You will be expected to pay if you fail to attend an examination that you have been entered for by the school unless you provide medical evidence within 7 days of the scheduled examination. You must provide medical evidence addressed to the Examinations Officer within seven days of the examination you missed (otherwise you will be invoiced for the missed examination). At the end of September, Boldon School were informed by the Joint Council of Qualifications (JCQ) that for this academic year Wednesday 26th June 2019 has been designated by the Examination Boards as a ‘contingency day’ for examinations. Students will be able to collect a copy of their results, in person, between 10 am and midday on results day. Any results which have not been collected at that time will be put in the post to your home address so please ensure you advise the school of any change of address after your examinations. If you would like your results collected by somebody different, or if you would like them posted to a different address, please complete the form handed out with your examination timetable and return it to Miss Korn, Examinations Officer. Results will not be issued to any other person without this written consent and cannot be given over the phone. Other examination series results will be issued in school time as they are received. Certificates will be held until the end of Year 11 and will be available for collection on the Celebration of Success Evening held towards the end of November each year. Students will be able to collect their certificates in person between 8.30 am and 4.15 pm Monday to Friday from school. If students are unable to collect their own certificates they can be collected by someone else however, they must have a letter signed by the student giving them permission to do so. Certificates will not be given to any other person without this written consent.